Dunedin's years of austerity appear over with the release of an $854 million plan proposing increasing rates, adding tens of millions of dollars of debt and selling city assets. 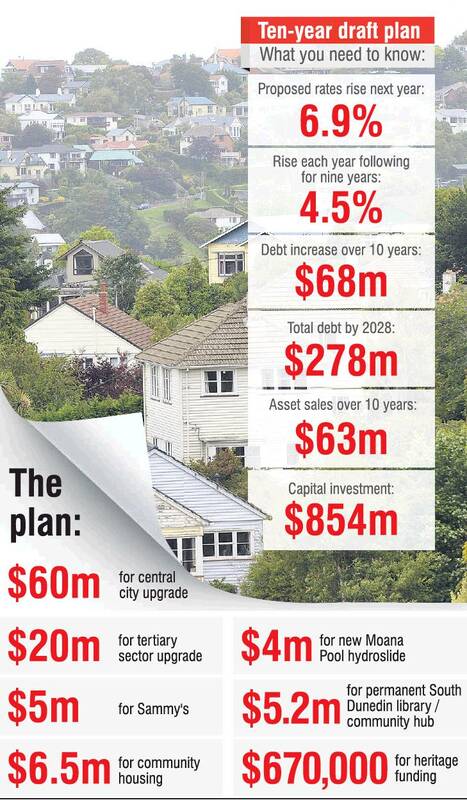 The Dunedin City Council’s draft 10-year plan brings to an abrupt halt years of rates rises of no more than 3% and work to bring down the city’s debt, policies Mayor Dave Cull has championed. Yesterday he defended the moves, saying the city had put off spending to keep rates low, but now had to do so to stay competitive with other cities. While the proposal may shock some ratepayers, the payoff is an ambitious programme of investment that should bring significant benefits to the city. Those include spending money on a bridge that could help launch the much-lauded harbourside plan prepared by Damien van Brandenburg, and adding millions of dollars for work to spruce up a tired-looking central city. It comes as the economic environment of the city is looking up, with a financial report included in the plan noting the population grew by 1800 in the year to July, with more growth predicted. The economy grew in that time by 2.4%. The plan was released yesterday and meetings next week will begin the process of discussion and public consultation before councillors decide on a final version next year. Depending on what councillors decide, and on the public’s feedback, the spending could be less than proposed.The plan said the council had been focusing on paying down debt and limiting rates increases. "We didn’t do many new things and we concentrated on getting our house in order and making sure we had the right structures in place. "This 10-year plan is different, as we’ve built a strong foundation and we’re now in position to invest and do the things we’ve talked about for years." But that may mean rates rises of 6.9% for the next financial year, and an annual increase of 4.5% for the nine years after that. Debt could increase by $68million in the next 10 years, and $63 million of assets could be sold. The plan includes capital investment of $854 million over 10 years. "To pay for everything that’s currently included in the draft budgets, we will need to increase rates and raise more debt," the plan said. Asked last night if the new draft plan was a massive shift in the Dunedin political landscape, Mr Cull said the council had reduced debt and kept rates rises low by deferring capital expenditure. It had managed to reduce debt by up to $60 million, and was well ahead of where it said debt reduction would be. Mr Cull said some of the investment required had become more urgent. "The centre city upgrade, for instance, is desperately needed if we’re going to keep the city competitive. "We’ve got to realise we’re competing for citizens with other places." "We’ve got to keep investing in the city, maintaining the lifestyle offering, but we’ve also got to keep renewing our infrastructure," Mr Cull said. Spending on assets like the city-to-harbourside bridge was necessary if development was to go ahead there. Asked about the point of reducing debt just to have it blow out again, he said the Government had been asked to help fund infrastructure. If councils had no debt, the Government would not step in and help. "There’s an expectation we will use debt constructively, just like businesses do. That’s what we’re doing." Asked if the council was selling off the family silver with its intention to sell assets, Mr Cull said it was not. Property sold would be that which was not providing a good return. On the benefits of the spending, he said ratepayers were getting good value for money with a wide range of services and facilities. "We remain a relatively lowly rated city compared with others. "But we can’t sit on our laurels, we have to invest to enhance the city, and that’s the benefit. "We want to be attractive so we attract people to come and live here." Council chief executive Sue Bidrose said it was important to remember the draft plan had "pretty much everything in it". Councillors would make decisions on what stayed in, what was dropped, and what was delayed. "This doesn’t mean the rates rise will be 6.9%, it doesn’t mean we will spend $854 million on capital expenditure, but the things we know were next cabs off the rank are all in here for councillors’ consideration." This council doesn't seem to question whether local 'economic development' is a proper function of local government. Mayor Cull's references to 'investing' in the city' and keeping it 'competitive' suggest a business model, involving marketing the city to outsiders (no doubt hopefully cashed-up ones) and a never-ending growth model at that. (Not very 'green'.) A bit different to what the Local Government Act says about infrastructure, public services and regulatory functions being the purpose of local government. Nothing about 'economic development' there.